Explore the Beauty of Alaska! Denali Highway Cabins offers charming boutique lodging in the beautiful foothills of the remote Alaska Range, nestled along the banks of the National Wild and Scenic Gulkana River. 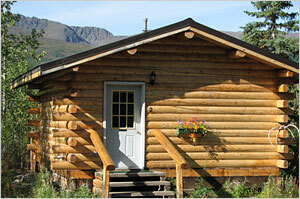 Located in the small community of Paxson, positioned exactly halfway between both Fairbanks and Valdez and between Denali National Park and Wrangell-St. Elias National Park, this log cabin retreat has long offered the adventurous and curious traveler a comfortable and sustainable base at the beginning of the fabled Denali Highway. Lovely and authentic log cabins, adventurous and exotic tent-cabins, and a cozy long-term vacation rental cottage await guests. All units are thoughtfully decorated and well-appointed with the comforts a modern traveler expects. Those staying in cabins can explore on their own or take part in our naturalist-led activities with Paxson Alpine Tours. Discover why the Paxson area is a favorite region for many Alaskans. Guests will delight in our mountains, alpine tundra, boreal forest, wild rivers, birds, wildlife, peace and quiet, and the historic Denali and Richardson roadways. Lonely Planet’s Alaska guidebook lists Denali Highway Cabins as one of their Top Picks for Lodging in the state, and calls us "Pure Alaska Gold"! Denali Highway Cabins is the perfect choice for discerning and knowledgeable travelers who want to combine wild, rugged wilderness with pleasant and comfortable lodging. Get ready to be cared for with the personalized attention and friendly service of a small family-run operation. Für diejenigen, die Deutsch verstehen: An interview conducted in 2015 by the host of Swiss Public Radio’s show "Rendez-vous”, which features quaint, memorable and historic hotels throughout the world. The introduction translates as: "In the middle of nowhere in Alaska, halfway between Valdez and Fairbanks, is one of the most distinctive accommodations in the USA: Denali Highway Cabins, where hosts Audie and Jenny offer "Luxury and Solitude in the Wilderness”.